Every person has a unique and individual experience with Vipassana, and I have read from others that it is best to go in without expectations. I am not sure how I feel about this, but I literally had no idea what to expect. I knew no one who had taken a Vipassana course. I had decided to do it with trepidation in order to deepen my own practice and professional experience with mindfulness. Basically, I saw it as part of my professional path. All this being noted, I am writing this article tentatively because in many ways, I am still trying to figure out what the h– just happened to me (to put it bluntly). When I first arrived, we were able to speak until we took our vow of noble silence at 8:00 p.m. This time frame was both interesting and awkward. I had two roommates, and I connected immediately with the one of them. She is a psychotherapist from Chicago finishing her residency, and she was interested in mindfulness practice for doctors. We had a lot to talk about. At the same time, we both agreed that the fact that the two of us had connected might make the ten days of silence strange; the connection could become an inconvenience. It did create a little awkwardness in some moments, but in others I was just incredibly grateful to have a human link with whom I could connect via occasional glance and half smile (despite the rules against such contact). Unexpectedly, these moments warmed my heart on days when I began to feel like the lack of connection to others, the utter solitude, was making me a little crazy (see my experiences after day seven of the ten-day retreat). I will start with the basics: the day starts at 4:00 a.m. with the wakeup bell. By 4:30 a.m. we would begin meditation, then breakfast at 6:30 a.m., followed by meditation for three hours, then lunch, then meditation for three and a half hours, followed by tea and fruit at 5:00 p.m., more meditation, a video recorded discourse, even more meditation, and finally around 9:00-9:30 p.m. we went to bed. In total, we meditated for around 10-10 1/2 hours a day. This was pretty much my “workspace” for ten hours a day. 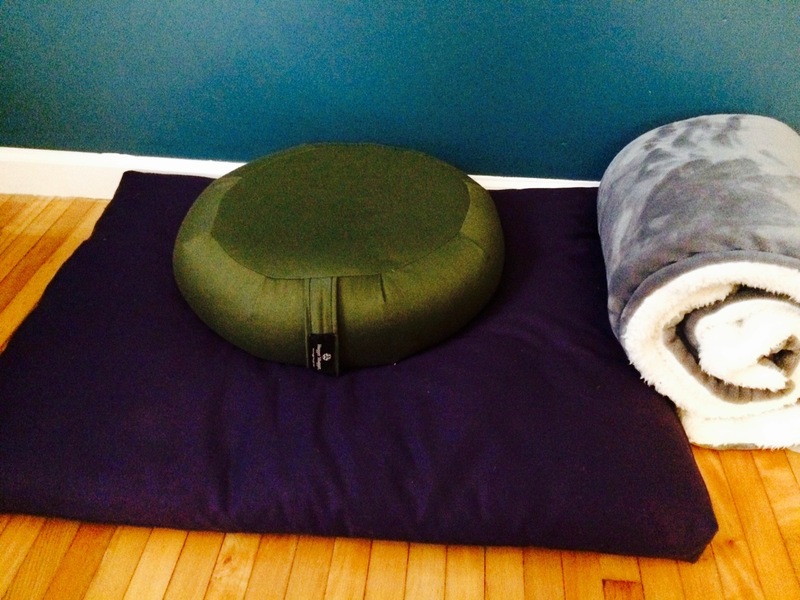 I was not allowed to take pictures at the facility, so these are the meditation cushions I brought set up in my bedroom. 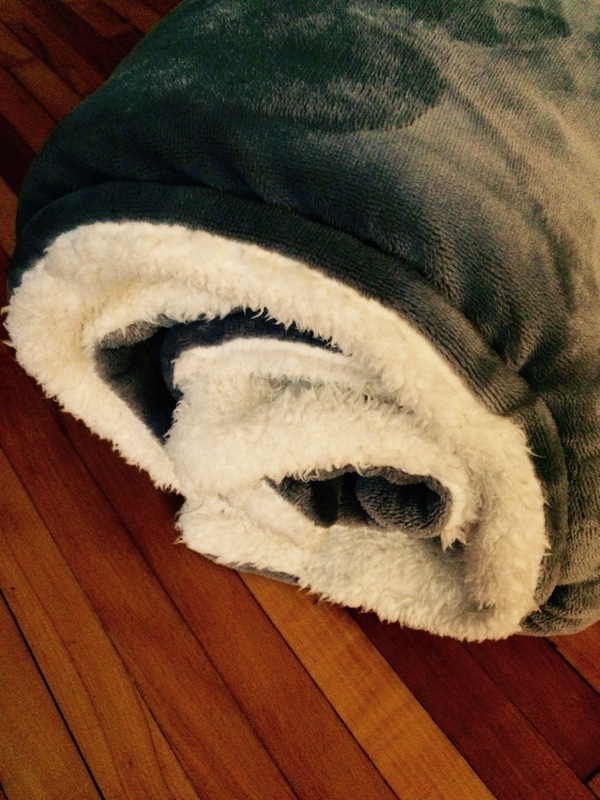 Can I explain what this blanket meant to me? Probably not. For the first three days, I carried in around like Linus in Peanuts. Yeah, it was like that. Physical challenges: Sitting in the same position for ten hours a day is very painful to say the least. My back ached continuously. When I tried a new sitting position on my knees with a pillow between my legs, I realized it would save my back, but that the insides of my thighs would begin to feel like they were on fire; this was preferable for the one-hour sittings (three times a day) that began on day five where we were not supposed to move our bodies at all or leave the room. While a part of my body might have been set aflame for the hour, I could save my back for the other seven hours I would still be required to meditate each day- the lesser of two evils. In addition to sitting issues, I also struggled with tiredness the first three days that made it hard to stay awake for the ten hours of meditation required. This faded over time, and eventually, I barely even needed the tea I drank each morning. I just wasn’t tired anymore. The food situation, however, never completely resolved itself for me. There were days that I couldn’t eat, then days where I was starving. There were mornings that I was physically sick from not having eaten a meal since 11:00 a.m. the previous day. On these days, I would have to go back to bed for an hour and try to recover after having a bowl of oatmeal and stewed prunes at the 6:30 breakfast. Mental Challenges: The first three and a half days were basically us focusing on the triangle of sensations on our nose, nostrils and upper lip in ever decresing surface areas for ten hours a day. By the third day, we were focusing on sensations in the space below our nostrils and above our upper lip only. Each day after day three, the meditation technique progressed into ever complicated expectations that included awareness of our entire bodies. The mental challenge of maintaining focus, and learning the evolving technique each day was in waves tiring and monotonous followed by challenging and frustrating. The first couple of days, visual images flashed continually. It was like a slideshow of unrelated dramas continually playing out in my mind. By the third day, I was experiencing long stints of inner silence, and by the time we actually got into the Vipassana on the middle of the fourth, it took 100% of my concentration to follow the technique and the only other consistent background noise (for the most part) seemed to be the chanting of Goinka (the Vipassana teacher who often chanted us encouragements via sound recording) cheering me on. This was progress, but there were many occasions where waiting for the meditation period to end consumed me to the point where all I could do was tell myself that time would- at some point- finally transition to something else other than sitting on this cushion in the dark. Emotional Challenges: This might have been the toughest thing. And totally unexpectedly. I am going to get more into these challenges, but as a precursor, this aspect of the experience grabbed ahold of me around day seven, and it really didn’t let go until after the course was over. This became the part that felt like I had entered some version of my own personalized torture chamber. To expand upon the emotional challenges and my resistance to them, let me make it clear that I had no intention of falling apart during this experience. Days one through seven, I watched my roommates faces begin to fill with what looked to me to be a void of defeat mixed with sorrow. In addition, I noticed that they were spending increasing amounts of time in bed each day. All of this terrified me. I felt as if I gave in to the bed, I would eventually succumb to clock watching and the days would move increasingly more slowly as I slipped into a depressed stupor. So, what did I do instead? I made meditation a competitive sport. I spent every hour but one of the ten in the meditation hall. In every moment of free time when I wasn’t meditating or eating, I was walking outside in the winter air, making loops around the small women’s area over and over. I spent little time in the room, and I thought to myself, “Yeah, this is hard, and yeah, I am counting the days and the hours, but I feel like I am okay. I got this.” I even remember being pleasantly surprised with how much I did not feel the urge to talk to anyone. It seemed the least difficult part compared to the physical stress and the mental focus that was needed to get through the day. All of this worked for me until day seven. I won’t go into all of the details, but let’s just say that I thought my cell phone (which I wasn’t supposed to have in the room and did for reasons that were not shady but stupid) was stolen. Since this is not a dramatic narrative of cell phone theft, let me ease your mind by telling you it wasn’t; To my embarrassment, I found it in my car (which I wasn’t allowed to go to during the retreat) the day I left. My first words in a week were to the “student manager” to tell her I needed to call my husband to get my cell service shut off. She did not comply with my request, and she told me that I seemed “agitated” and that I should just keep meditating. Somehow this seemingly crappy but by no means devastating situation became my downfall. I developed paranoia about one of my roomates who I thought might have taken it. I went to talk to the teacher and started sobbing- like wracked uncontrollable sobbing- that didn’t stop until an hour after I had left our interview. I started having really intense meditation experiences that were at times somewhat elating and other times very confusing and a little scary. I talked to the teacher more. He tried to guide me, but his words at times seemed cryptic and weren’t always comforting. During this time, I also started to deal with some very deep rooted fears that I have. One of these fears could be simplified in the questions, “Am I normal? Is this okay?” I have (obviously) taken a little bit of a non-traditional path in my career and personal life, and all of these transitions did not come easy (see My Personal Mindfulness Journey). There were, and occasionally still are, moments when I wonder if I am a weirdo or if I am inherently flawed in some way that other’s aren’t. (This is an ego thing in and of itself, but I won’t digress into that for now). At the retreat, I started having to deal with these deep-rooted fears in the most real way possible. I felt crazy. I wondered if I had “broken myself” in some way, or if this experience had perhaps just uncovered a brokenness that was already there just waiting to surface. This continued throughout the rest of my experience, and although it became more manageable, by the time we were able to finally begin talking on day ten, I was still not sure what was going to come out of my mouth. Was I okay? It turns out I was. It also turns out that my experience: paranoia, strange meditation experiences, intense confrontations with my worst fears, are not uncommon. One of my roommates shared with me that she had intense, very vivid dreams every night about life circumstances she had tried to repress that still consumed her after she was awake. Another person (who was on her fourth retreat) told me that on her first one, she wondered if they put drugs in the food and had tried to plot an escape from the facility until she had a meditation breakthrough that made her stay. I heard a number of stories like this; I needed to hear them to understand the context of what I had just experienced. It also helped to hear from others why they kept coming. For those attending one of many retreats, they all had really positive things to say about the aftereffects. “My husband thinks I am like a different person.” “I have less fear and sadness in my life in general.” These were a couple of the statements I heard. Just to make it clear, not every one has these confrontational experiences either. Some people said things to me like, “I could stay for ten more days” or “I will definitely do this again” as soon as they were able to speak. In addition, while others had experiences that might have shared some similarity with mine, it was very clear that each person’s journey was their own and related to their life and their struggles. So what were my after effects? Would I recommend this? What did I learn? All of these seem like important questions to answer, and yet I know right now I don’t have definitive answers for them. I know that since being home, I am insanely grateful for my family. I missed them so much that the drive home seemed almost as painful as the three hour meditations. I know that I feel like I understand (somewhat) how much I don’t understand. The experience made me think about meditation and being a teacher of mindfulness in some new ways which I will ponder for a long time. I know I learned that humans are way more complicated than I realized and that there is a lot below the surface that comes out when left to our own devices, when isolated from all that creates our sense of self, when cut off from the communication that helps us to make sense of the world. I know the things I missed most (and the things I didn’t miss at all) say something about the way I should be living my life. I didn’t miss coffee, alcohol, social media or texting. I did miss my family; writing; and my own practices, such as my daily yoga and journaling among others, which we were asked to leave behind. Upon reflection, one of these lists is more life-giving than the other. I know that I am lucky. Lucky to have opportunities where I step to the edges of who I think I am and what fits into the norms of society and peek over into the abyss. This is all I really know right now. I will keep reflecting and see what else I find along the way. It has been one heck of a journey so far. Questions? Comments? Feel free to leave thoughts on the post. Well done Bandi! Mom is smiling !! Thank you so much, Randy. You just brought tears to my eyes. Absolutely fascinating. Thanks for sharing. You are very welcome. I am glad you found it to be interesting.